Screen Printing is arguably most versatile in printing, almost everything can be used as substrate. 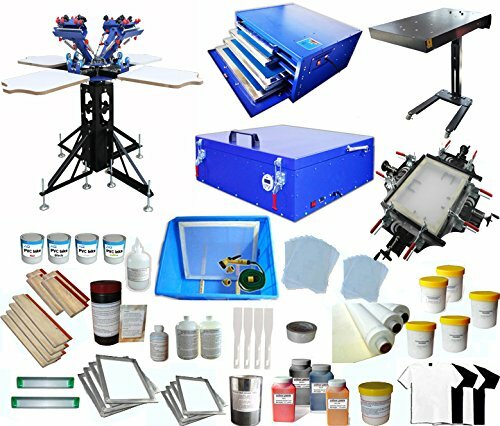 Our company provide this 4 color 4 station screen printing package with all stuff needed by a small screen printing workshop. we show buyers skilled operation and application by words and video, achieving integration of technique ,equipment, material and service. Screen Drying Cabinet （006005）Specifications Voltage 110V Power 800W Plug standard US, Canada Machine size 27.9"x24"x12.2" (71x61x31cm) Packing Size 32.6"x27.9"x15.7" (83x71x40cm) Net weight 80Lb (36kg) Shipping weight 88Lb (40kg) Note: * Max screen frame size : 25"x21"(64x53cm). * The top layer need to put in the screen frame in vertical direction.